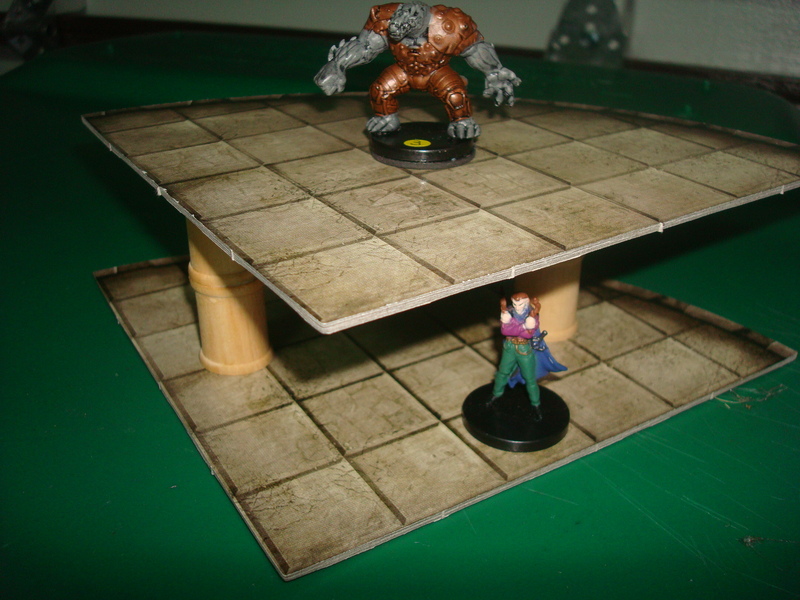 Today I have another post on Dungeon Tiles, following yesterday’s article. This one will be short, as I haven’t quite tested it out in actual play. I posted a few pictures on my twitter account, which I’ll post here, where I try to add a 3d element to my Dungeon Tiles. Next gaming session I plan to add this to my encounters. Of course, it goes without saying that this requires the encounters to be pre-built ahead of time. 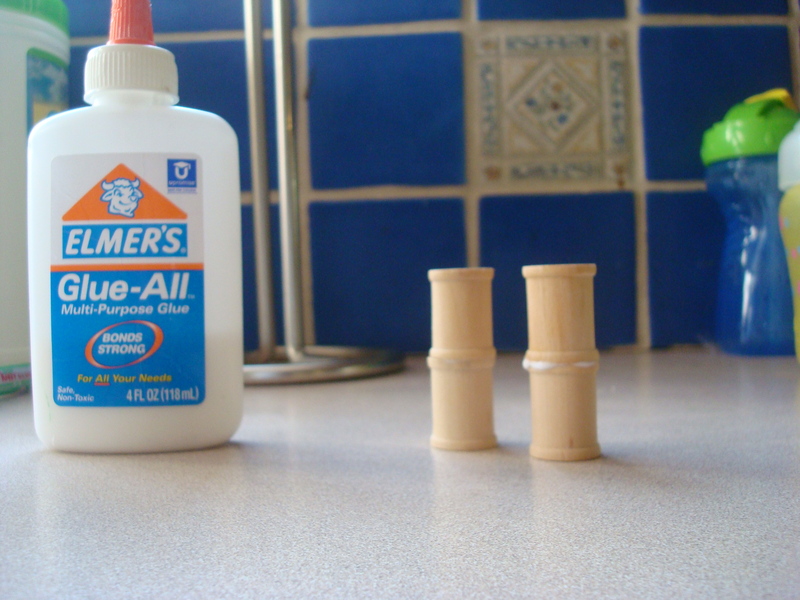 What I did was the following: I bought some wooden spools at Michael’s, glued two of them together to create a column, and used poster putty to hold them down to the tiles. I then applied the same putty to the top to hold the second layer of tile in place. Fairly easy really, and non expensive. I’m really curious to see how the 3d combat is going to play out. I’m toying with the idea of converting everything to cubes. A Blast 3 power is a cube that goes 3 in every direction essentially. I think this may add a whole new tactical element to combat, and it opens the door towards way more interesting encounter areas and terrains. We’ll see. Expect a post on that experience as soon as I play again in a few weeks. For now, here are more pictures, and if you have any experience with 3d combat in 4th ed. please share in the comments below. Could that be a balcony? Very cool stuff. I’ve done the same thing, except I used a Red Bull can as the column (http://twitpic.com/exrx4). I’ve recently downloaded the Himmelveil Streets PDFs from WorldWorks Games (http://www.worldworksgames.com) and I’m hoping to print some out this weekend and put them together for my game. I too have done something similar to this (I used toilet roll for the record). 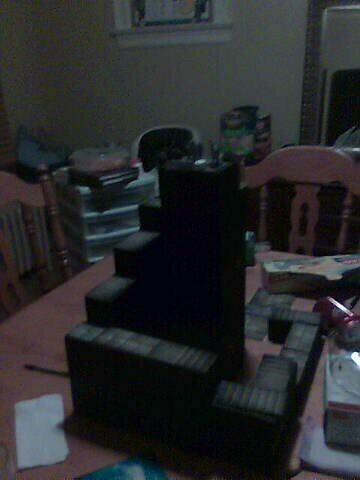 I built a bridge crossing for my party. Started by drawing 1×1 inch squares onto card and building the set from this. I too used the cube method of working out areas of effect, and it worked really well, especially when someone was under the bridge! Ive done multi level stuff here one area wasn’t the roof of the other. This seemed to work. Having a ceiling can make it hard to get to the minitures. However i did once build a massive tower, PC’s had to get to the top for the epic battle. But flying undead creatures kept getting in the way. As you can see PC’s had a chance to fall inside the tower. I’m curious as to what challenges you run into when you play this? I’ve personally be reluctant to invest in tiles but a 3d Element to the game would be quite visually interesting and present better ideas to my gamers. @Mike, wouldn’t it be easier to generally assume there is a roof on most of the buildings the players are in, but not actually put in a roof? If only to get to the miniatures. @tyson: The issue would be how 4th ed. would adjust to 3d. Normally, everything is on a flat plane, but the element of 3d opens up questions on how the powers work, etc… But yes, tactically, it is a different monster for the players. 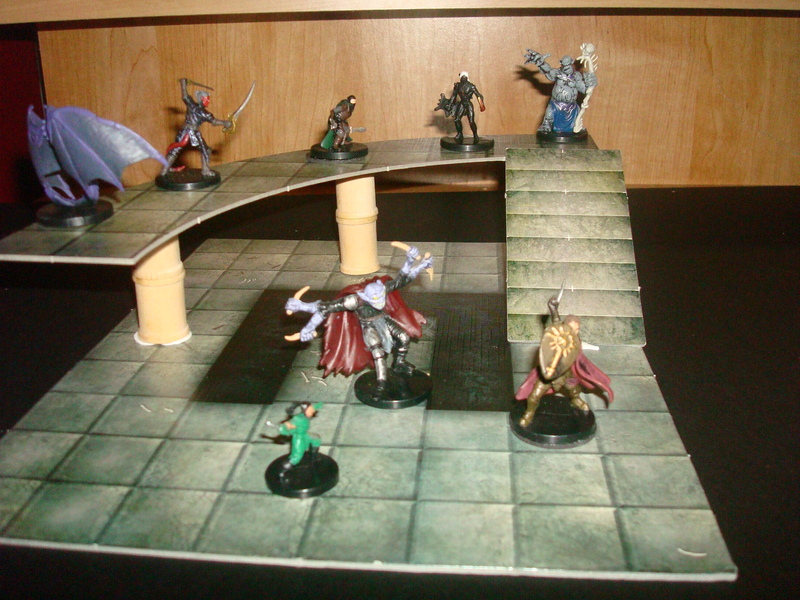 I remember the map of the mill for the PHB2 D&D Day adventure had a balcony where the artillery demons sat. The entry door was below the balcony. Would have been great to actually represent that in 3D. I’ve run several other encounters where there were multiple elevations. The issue of having blasts and burst as 3D elements has come up in my game. Our invoker chose not to pick the angel summoning daily because the burst attack was a flat plane rather than a cube. I have a feeling that making the aoe 3D is a power boost, but it’s definitely a mechanic worth toying with. I’ve done the same thing several times and it’s worked out quite well. 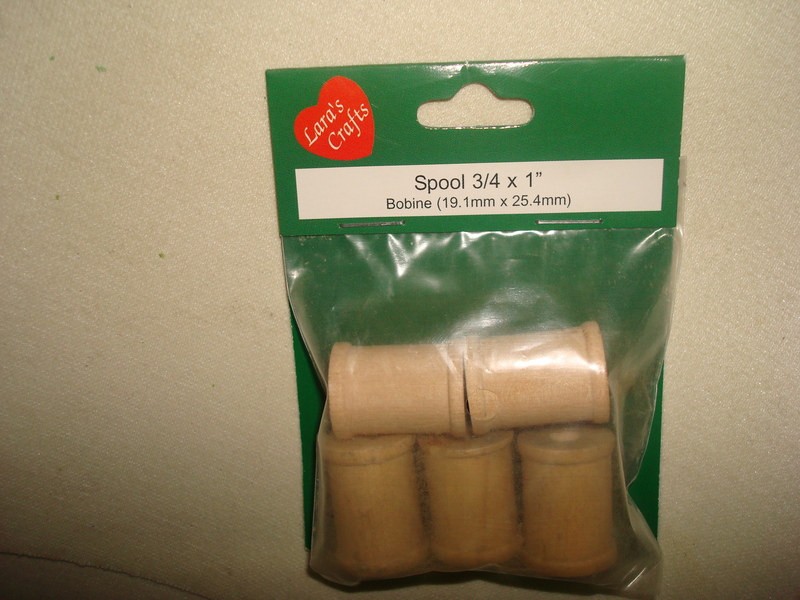 And I mean almost exactly the same thing, using 1″ wooden spools from Michael’s as the pillars. So tell us, how does the 3d work with the powers, what do you do? I actually did some 3d action in my first 4e adventure, using the dungeon tiles and the framework pieces from Necromunda (old Games Workshop game). 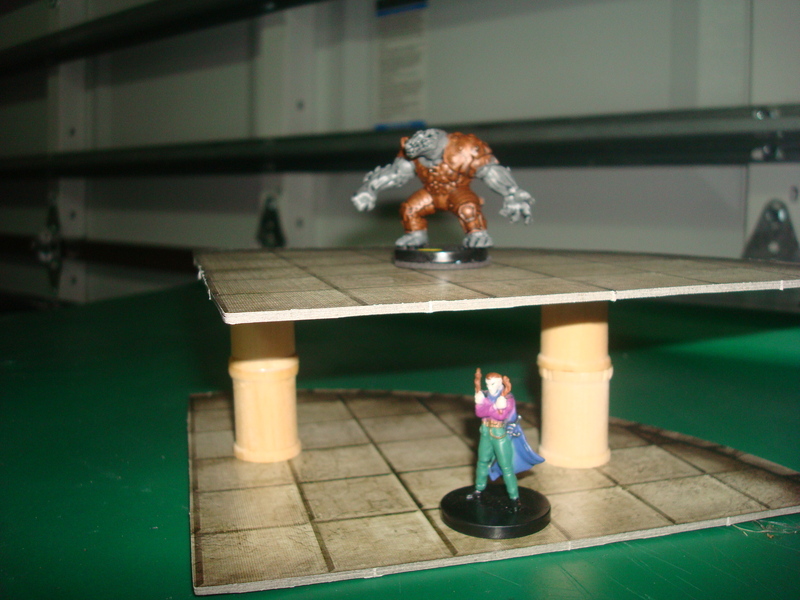 It really made the encounters more exciting for the players but the supports did not work as well with the tiles as I would have liked. I’m definitely going to try your method with the ‘fun tack’ and spools though and bring the 3d back in to it. Pictures of my earlier adventure here: http://thegamerdome.wetpaint.com/photos all the pics have MoP in front of them for the area they were in – “The Mines of Pain”. Not a good vacation spot. Cool pics. I’m planning on snapping tons of pics of my next gaming session, I’m dying to try out this 3d stuff. I think it’ll add a layer of tactics as well. Another option might be pizza box tents, those three legged things they use to keep the box from soaking up all that wonderful pizza grease. You could just use the hexes from the game Heroscape. 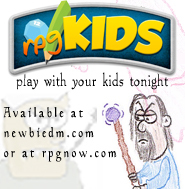 It requires a little adjusting, I believe I saw rules somewhere for D&D 4E on hexes. I’ve also seen people eliminate spaces completely and use tape measures and Warhammer like terrain.